The basic purpose of structural reliability analysis is to obtain the probabilistic responses of structural systems with uncertain design parameters, such as loadings, material parameters (strength, elastic modulus, Poisson’s ratio, etc. ), and shape dimensions. Among the methods available for these problems, the response surface method (RSM) is a powerful tool . The theory and methods of RSM have been developed significantly during the last twenty years and have been documented in an increasing number of publications. Although, from a theoretical point of view, the field has reached a stage where the developed methodologies are becoming widespread, RSM used to analyze large structures is still a complex and difficult task. In order to solve this problem, a rigorous series of tests has to be carried out. Linda and Ping (1999)  constructed confidence intervals about the difference in mean responses at the stationary point and alternate points based on the proposed delta method and F-projection method and compared coverage probabilities and interval widths. Zheng and Das (2000)  proposed an improved response surface method and applied that to the reliability analysis of a stiffened plate structure. Guan and Melchers (2001)  evaluated the effect of response surface parameter variation on structural reliability. Byeng and Kyung (2004)  proposed the hybrid mean value (HMV) method for highly efficient and stable RBDO by evaluating the probabilistic constraint effectively. Gupta and Manohar (2004)  used the response surface method to study the extremes of Von Mises stress in nonlinear structures under Gaussian excitations. Herbert and Armando (2004)  compared RSM and the artificial neural network (ANN) techniques. Irfan and Chris (2005)  proposed a new response surface called ADAPRES, in which a weighted regression method was applied in place of normal regression. Wong et al. (2005)  proposed an adaptive design approach to overcome the problem, which was that the solution of the reliability analysis initially diverged when the loading was applied in sequence in the NLFE analysis, and made several suggestions to improve the robustness of RSM. Jiang et al. (2006)  improved the method to fit the indeterminate coefficients of response surface. Jin Weilian and Yuan (2007)  presented a response surface method based on least squares support vector machines (LS-SLM) aiming at the reliability analysis problems with implicit performance function. Chebbah (2007)  dealt with the optimization of tube hydro forming parameters in order to reduce defects which might occur at the end of forming process such as necking and wrinkling by RSM. Jin et al. (2008)  presented a new artiﬁcial neural net work-(ANN) based response surface method in conjunction with the uniform design method for predicting failure probability of structures. Henri and Siu (2008)  described the use of higher order polynomials in order to approximate the true limit state more accurately in contrast to recently proposed algorithms which focused on the positions of sample points to improve the accuracy of the quadratic the stochastic response surface method (SRSM). TongZou et al. (2008)  presented an accurate and efficient Monte Carlo simulation method for limit-statebased reliability analysis at both component and system levels, using a response surface approximation of the failure indicator function. Xuan et al. (2009)  proposed an adaptive construction of the numerical design, in which the response surface was fitted by the weighted regression technique, which allowed the fitting points to be weighted according to their distance from the true failure surface and their distance from the estimated design point. 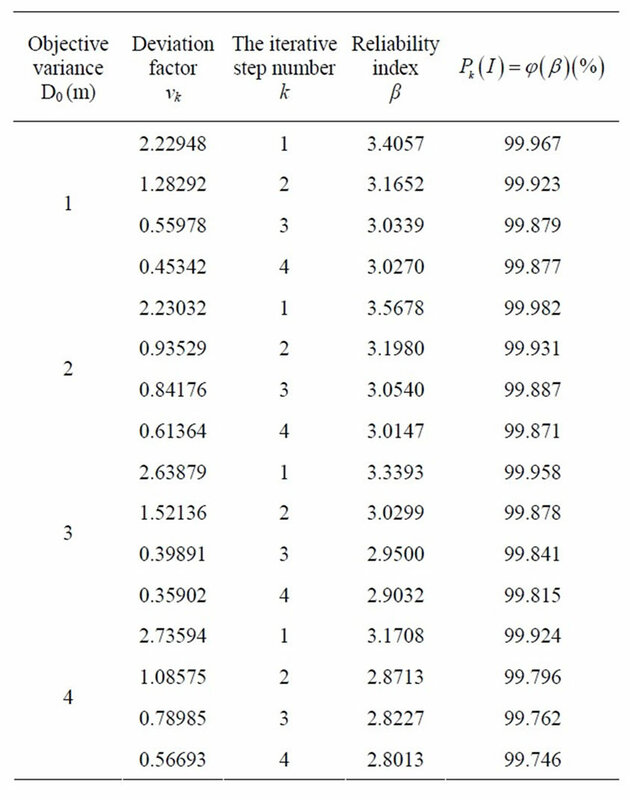 To date, however, most reliability methods such as the first order reliability method (FORM) , the secondorder reliability method (SORM) [18,19], the weighted regression method (WRM) [20,21], and the space reduced weighted regression method (SRWRM)  cannot be used to analyze large structures. These traditional reliability methods have two aspects of deficiencies. On the one hand, limited state function is usually implicit when we use a finite element method (FEM) to analyze structure. It leads to the difficulty in obtaining implicit limited state function for basic random variables. On the other hand, in order to overcome the above defects, some reliability methods use polynomial response surface function to fit implicit limited state function, but the number of basic random variables is very large when analyzing large structures. And these reliability methods need more experimental points to confirm the indeterminate coefficients of these basic random variables. It follows that, during the process, the calculation efficiency and the storage efficiency of these methods are very low. Even in some large structures, it is impossible to obtain enough experimental points. Therefore, most of reliability methods only can be used to analyze small structures. It has now been widely recognized that the most reasonable method for dealing with such multiple excitation problem is the random vibration approach. Among a great deal of research activities, the reach work by Kiureghian  and Ernesto  are representative. They all developed their research about the seismic analysis of longspan structures based on random vibration approach. Nevertheless, when solving the high degree random differenttial equations, they all faced unacceptable computational efforts. Compared to these algorithms, Lin  proposed a pseudo-excitation method, which was an accurate and highly efficient algorithm series for linear structural stationary random response analysis, to deal with dynamic response of structures subject to random seismic excitation. In this method, the determination of random response of a linear structure was converted to the determination of response of the structure under a series of harmonic loads. By using this algorithm series, the aforementioned difficulties in the stationary random response computations of long-span structures were satisfactorily resolved. Based on this algorithm, Lin  et al. analyzed nonstationary random responses of linear structures subjected to evolutionary random excitation. The analytic thought was that the random excitation was first transformed into a pseudo excitation to generate deterministic equations of motion, which were then solved by means of a modified high precision direct integration method. Furthermore, Lin  et al. developed the inverse pseudo-excitation method for dealing with loading identifcation problems. Then, Lin  et al. utilized this algorithm to make probabilistic analysis for long-span structures such as longspan bridges , non-uniform beams  and so on. Other researchers carried out a rigorous series of algorithms in order to improve and develop pseudo-excitation method. Xu  et al. presented a new algorithm for buffeting analysis of long span bridges, featured mainly by a complete finite element approach and a pseudo-excitation method and then used this algorithm to make fully coupled buffeting analysis of Tsing Ma suspension bridge  and vibration analysis of wind-excited structures . Then, based on the pseudo-excitation method, Xu [34,35] et al. and Zhang  et al. also presented closed-form solution for seismic response of adjacent buildings connected by hydraulic actuators with linear quadratic Gaussian (LQG) controllers. Based on the pseudo-excitation method, Sun  et al. presented a formulation for fully coupled buffeting analysis of long-span cable-supported bridges, in which dynamic coupling between modes of vibration, dynamic forces on bridge deck and towers and cables, and varying wind speed and structural properties along the bridge deck and towers and cables can be taken into consideration. Li  et al. utilized pseudo-excitation method for the random vibration analysis of seismic responses of tall buildings. Xue  et al. utilized the pseudo-excitation method to make a random vibration study of structures under multi-component seismic excitations. Li  et al. extended the pseudo-excitation method with the stochastic orthogonal polynomial expansion method to make response analysis of stochastic parameter structures under non-stationary random excitation. 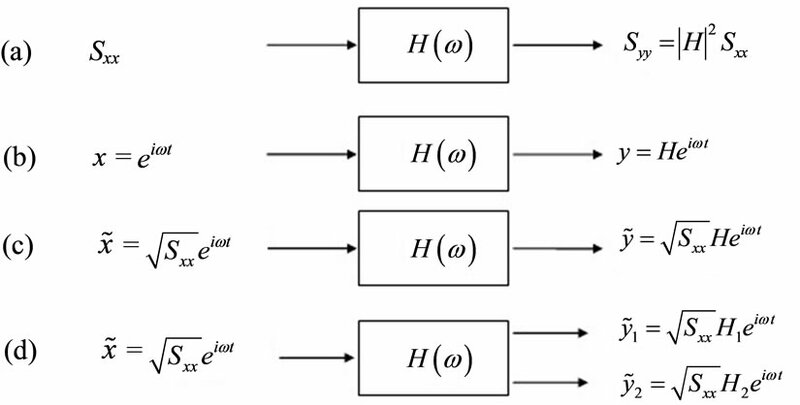 Nevertheless, the pseudo-excitation method only is utilized to analyze linear structures because this method is derived from superposition principle, which only is applied to linear structures. In this paper, we construct an approach to calculate the functional reliability, which is denoted as the displacement at the head of gravity dam. 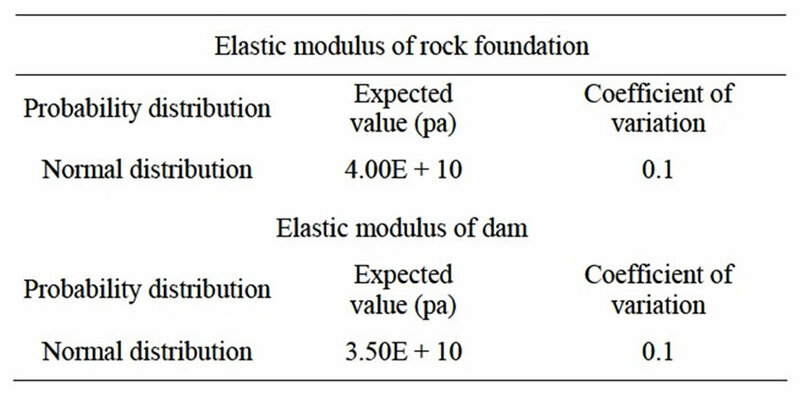 The Pseudo excitation method and the response surface method based on weighted regression are associated to analyze the functional reliability of gravity dam. Ultimately, a test example is utilized to verify and analyze the convergence and stability of the proposed method. where E(#) denotes the expected value of variable #. where and denote the expected value and variance of . when = 0, can be determined from . Pseudo excitation method is the numerical methods for and the basic principle of the pseudo excitation method is depicted as Figure 1.
where denotes the conjugate of . where f and V denote internal force and displacement, respectively. Here, all random variables are assumed to obey Gaussian distribution. Because other distribution form can be translate into Gaussian distribution easily, and Gaussian distribution is extensively applied in the analysis of random variables. 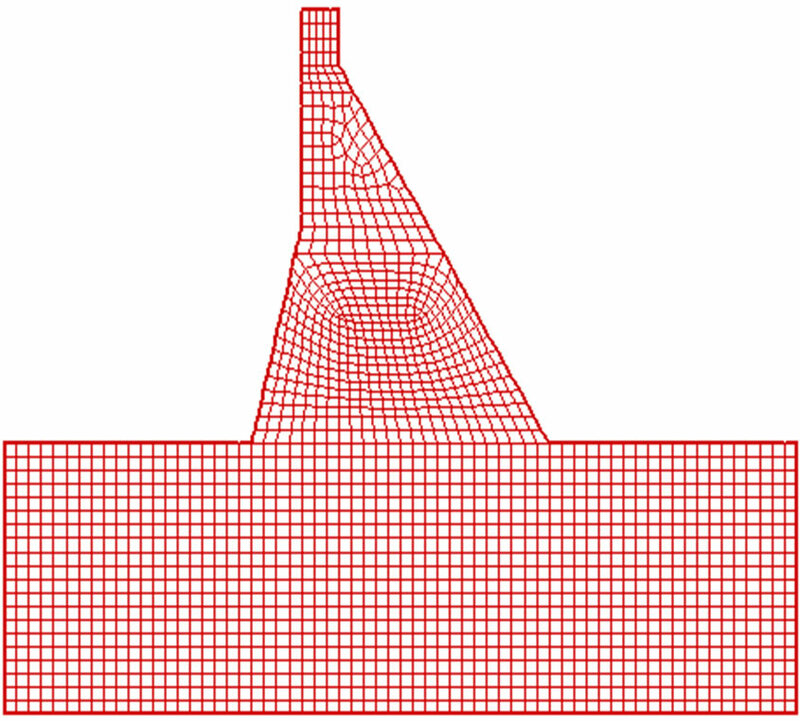 When dam is excited by static and random seismic load, the element’s displacement of dam is random variable. From static analysis of the dam, the expected value of displacement of element k is obtained. And the variance of displacement of element k can be derived as follow. where , and denote acceleration, velocity and displacement of nodes in dam model, respectively; , and denote stiffness matrix, damping matrix and mass matrix of dam model, respectively; denotes random seismic load. 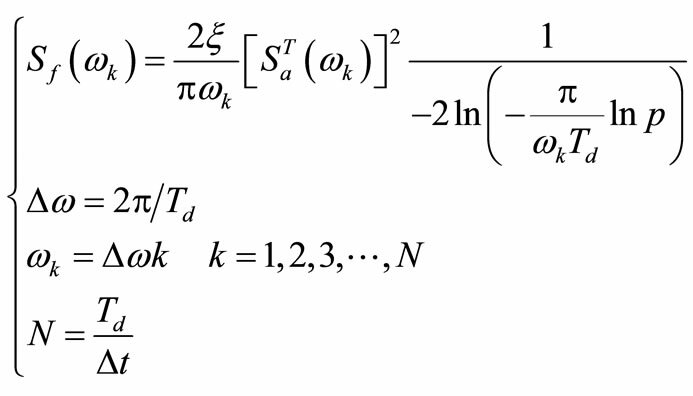 From Equation (16), it should be noted that gravity dam under random seismic load is a linear system. Accordingly, the pseudo excitation method can be utilized in aforementioned system. where and denote pseudo excitation and the power spectrum density of random seismic load, respectively. Figure 1. The basic principle of the pseudo excitation method. where denotes pseudo displacement response of element k.
where is the objective displacement. is the probability due to the randomness of the elastic modulus of element k and is the conditional probability of element k due to the randomness of seismic load under the condition of these random elastic modulus. where is the objective variance of element k. It can be observed that this expression has considered the randomness of seismic load. The implicit limited state function is denoted as the discrepancy between and under the condition of random elastic modulus of element k.
Ultimately, the functional reliability should be derived through above procedure. where and are target response spectrum and damping ratio, respectively; ( ≤ 0.15) and are exceeding response spectrum probability and duration of ground motion, respectively; and are the number of trigonometric series and time step, respectively. Thus, it should be observed that the functional reliability is taken as the reliability for the displacement of gravity dam head. And the displacement of dam head is regarded as the functional reliability of overall gravity dam. Figure 2. Sub zone of materials in dam and its foundation. each element are shown in Table 1. The result of of gravity dam is shown in Table 2. The result of functional reliability of gravity dam is shown in Table 3. 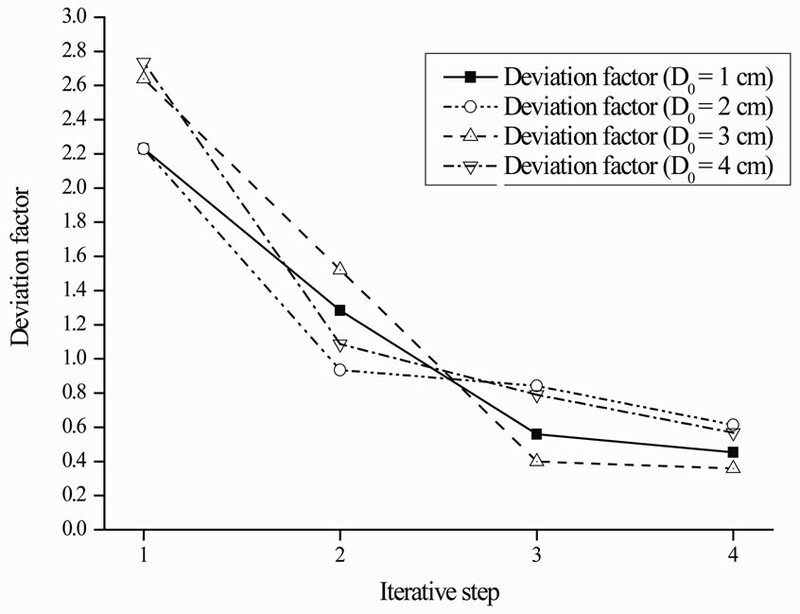 And the deviation factor iterative procedure is shown in Figure 3. 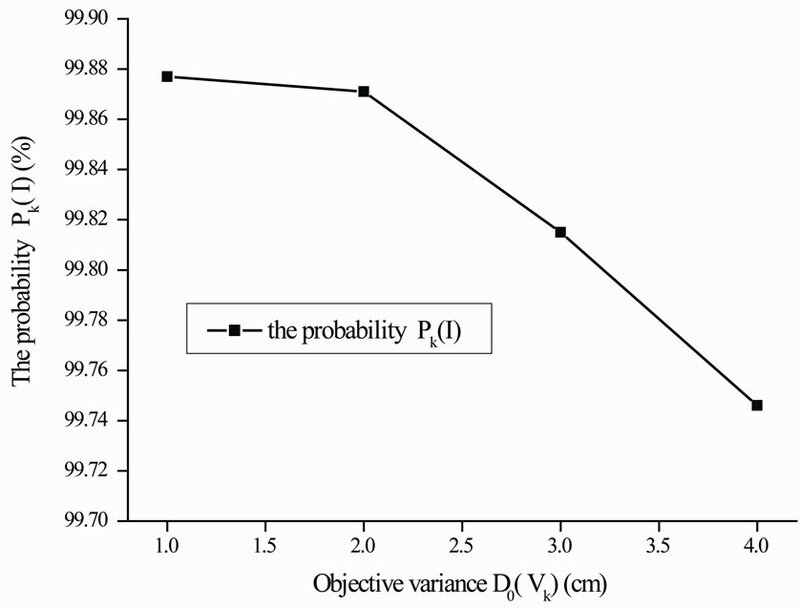 The relation between objective variance and the probability is shown in Figure 4. 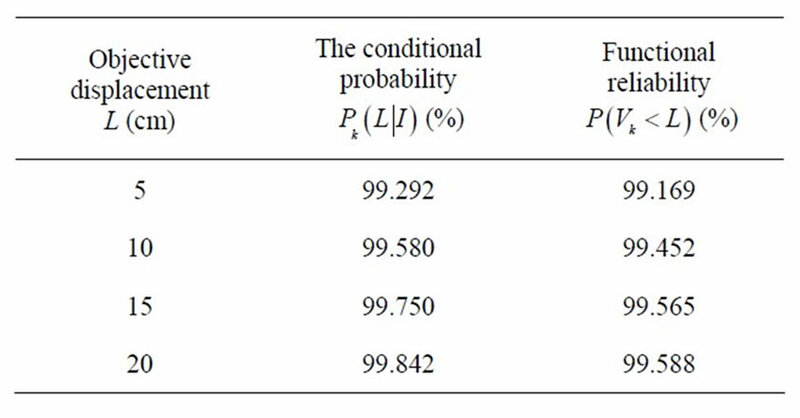 The relation between objective displacement and conditional probability is shown in Figure 5. 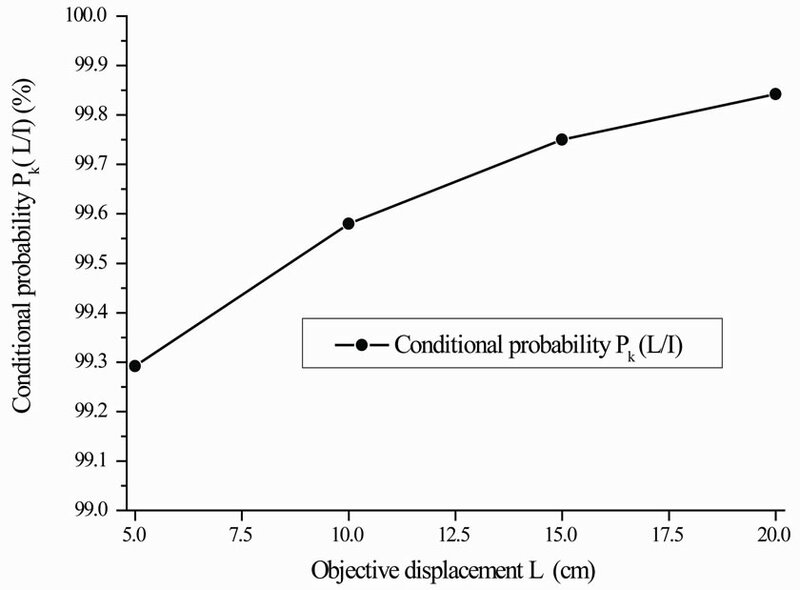 The relation between objective displacement L and functional reliability is shown in Figure 6. Table 1. The probability distribution of all random parameters of each element. Table 2. The result of of the displacement of the head of gravity dam. In each iterative step of the method of this paper, only 100 experimental points are utilized to approximate implicit limited state function while the traditional response surface method needs 4865 experimental points. Thus, the method of this paper saves a lot of storage space and can be applied in analyzing large structures such as gravity dams. Table 3. Result of functional reliability of the displacement of gravity dam head. Figure 3. Deviation factor iterative procedure. Figure 4. The relation between objective variance and the probability . Figure 5. The relation between objective displacement L and conditional probability . Figure 6. 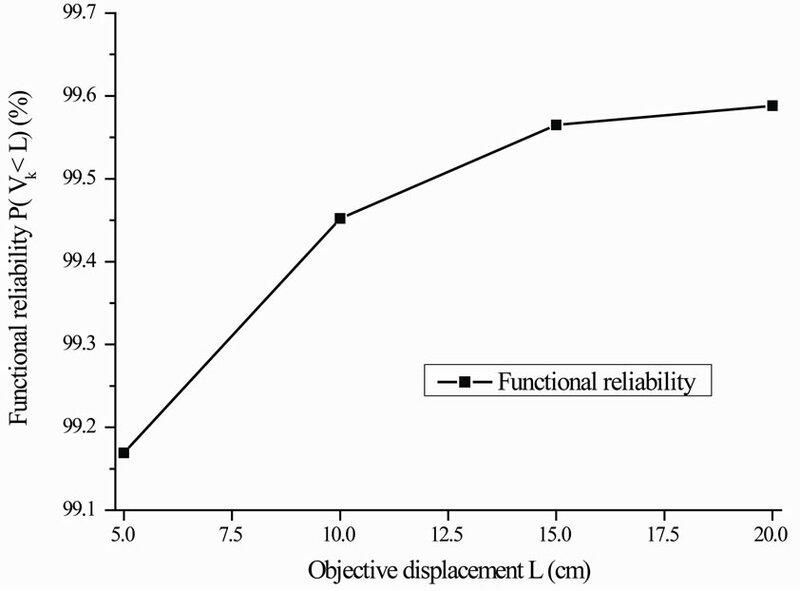 The relation between objective displacement L and functional reliability . From Figure 3, it can be seen that convergence rate of the proposed response surface method based on weighted regression is high. The iteration process achieves stability normally at fourth iteration step. From Figure 4, it can be observed that the probability decreases while the objective variance increases and they are substantially appeared inverse proportion relation. From Figure 4, it can be observed that the conditional probability and the functional reliability increase while objective displacement L increases and they are obviously exhibited direct proportion relation. Meanwhile, they all appear exponential characteristic. From Table 3, it can be seen that the functional reliability of overall gravity dam is 99.169%, 99.452%, 99.565% and 99.588% when the objective displacement is 5 cm, 10 cm, 15 cm and 20 cm, respectively. And it indicates the security of the gravity dam is high. In this paper, we construct an approach to calculate thefunctional reliability, which is denoted as the displacement at the head of gravity dam. The Pseudo excitation method and the response surface method based on weighted regression are associated to analyze the functional reliability of gravity dam. Ultimately, a test example is utilized to verify and analyze the convergence and stability of the proposed method. This study was supported by Project supported by the National Natural Science Foundation of China (Grant No. 51109029, 51178081, 51138001, 50909015, 51009020). and China Postdoctoral Science Foundation (Grant No. 20110491535).